The Code is a fantastic twelve-point honour code to help men live their Christian lives in a practical and faithful way. It’s a rule of life for that helps Christian guys stay gripped and focussed on living a full on, uncompromised Jesus centred life, in company with others. And now with the help of music, The Code has an added dimension to help men live by the principles of The Code and stay centred in Jesus. Over the past few years we have developed a range of Code resources including a book of The Code, group study material, outdoor men’s days, (CEV) Bible with highlighted Code themes with more items to come. The latest in this range is the Code Music CD. 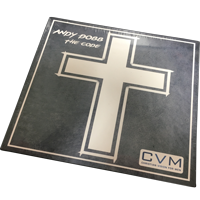 This album of 12 songs based on all the codes, created by a songwriter Andy Dobb, whose life has been transformed by Jesus and and whose walk with God, has been galvanised by The Code. The CD can be used in a meditative way accompanying The Code, as part of personal/corporate worship or listened to as an album of good stand alone music tracks.